Rise and shine! It's time to energize your day with some freshly pressed juice! Drinking a brightly-colored glass of juice will give you a natural boost of energy. How could it not with all of those wonderful flavors and does-a-body-good nutrients? Rise and shine! It's time to energize your day with some freshly pressed juice. Drinking a brightly-colored glass of juice will give you a natural boost of energy. How could it not with all of those wonderful flavors and does-a-body-good nutrients? 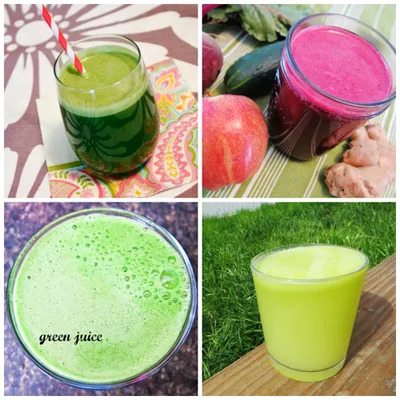 Try drinking one of these freshly pressed juices (below) first thing in the morning (it's a great way to start the day), and you'll feel healthier and more energized before you even finish the glass! Coconut-Kale-Ginger Juice: All of my favorite ingredients in one juice recipe! The coconut water adds a light sweetness while the kale gives a rich green color and the ginger provides a little zing. Beet-Apple-Ginger Juice: The color of this juice is incredible! I always feel a little boost when I drink fresh juice made with beets. Thanks to some apples and ginger, this one isn't too bitter. Pineapple-Green Apple Juice: There's nothing better than fresh pineapple, which makes it a great addition to freshly pressed juice. Combined with green apple and a little bit of lemon, this juice won't disappoint! Everyday Green Juice: This is my go-to juice recipe. Made with leafy greens, cucumber, celery, apple, and ginger, you can't do wrong. It's delicious and nutritious. I drink this juice almost everyday.